1964 1961 Ford bus project ready to report in our Part 2 video. 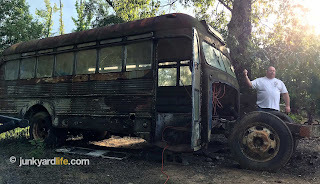 We started with the rescue in Part 1 and the intention of creating the ultimate "Remote Vehicle Recovery System" from what was left of the 1961 Ford bus chassis. We wanted to make a 4x4 party bus with a super towing package. Then things got interesting. The three-legged dog that is JYL, Keith, Ron & Jody, put their heads together to develop something wild. A hair-brained scheme of stupid proportions. The lightbulbs began glowing hot after we recently hauled a very rusty 1965 VW Bus out of the woods. VWs are cool and everybody loves them. That got us our minds swimming with possibilities. What could command more attention than a mega-size 1965 VW Bus 4X4 with a Cummins turbo diesel and a 6-speed? Nothing! 2005 F350 Chassis and 6-speed transmission ready to graft into the existing 1961 bus frame. 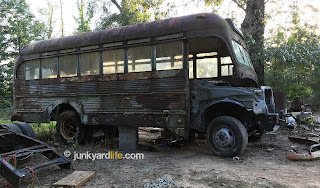 The engine and front wheels will move back several feet from original bus design to mimic VW bus design. We got excited and started gathering parts and hauling in donor vehicles to fund our super-low-budget VW bus. We snagged a 2005 F-350 4x4 chassis and 6-speed manual transmission at auction. The 5.9 Cummings that will power the mega bus is from a 1997 Dodge pickup. 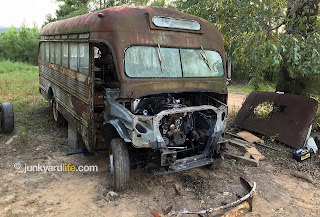 A few salvageable parts from the ’65 VW bus may be included in crafting the bumpers. Much of the metal work will be custom built. 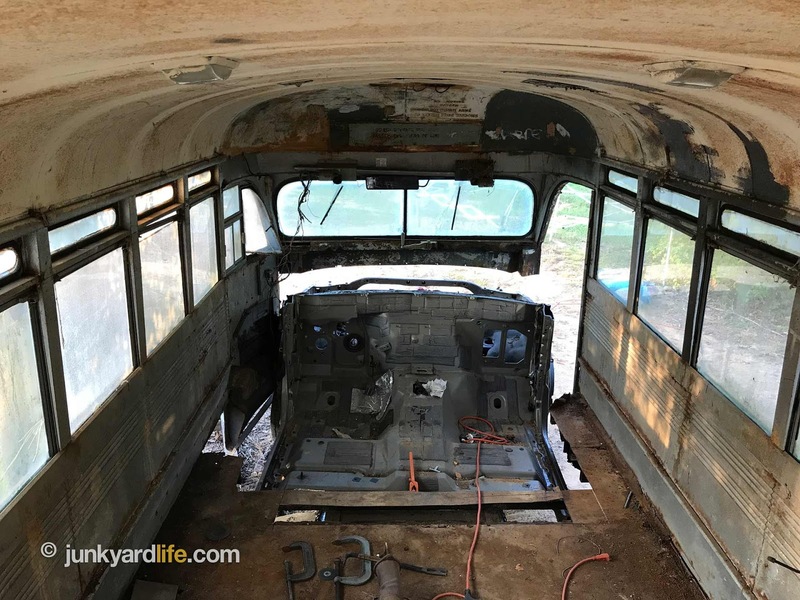 Fabricating the up-sized parts will be necessary to keep the VW bus proportions true to the original VW design on the Ford B-600 body. We’re planning on scaling up the exterior parts. Lots of cutting and welding to do on this custom project. Cutting wheels and metal-cutting saw blades are getting used up fast! Nobody said we make things easy on ourselves. 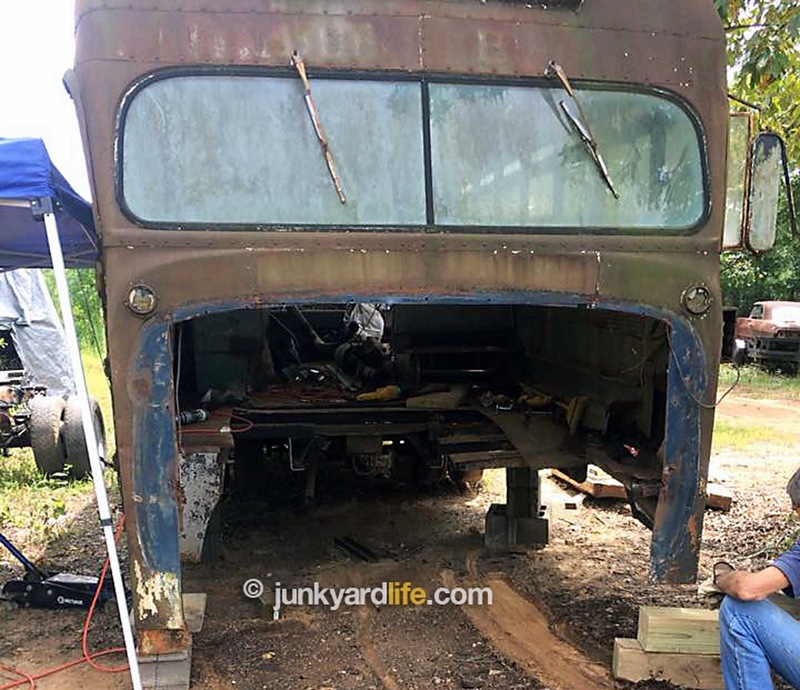 This is initial placement of 2005 Ford F350 chassis, along with drivetrain in Junkyard Life's project bus. Much work to do yet. Now that the chassis is taking shape, we need your help. Do you have a name for the bus? More important than that are parts. Do you have some old VW parts to spare? We need a little bit of everything with something this big. We were given an old GMC RV that we will be able to scavenge the A/C units, bed, cabinets, dash parts, and wiring harness. Every little bit helps. Drop us a line if you can spare something. We are low budget builders. We want to have way less than $5000 in this by the time we are done. 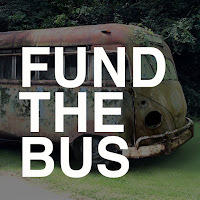 We even started a Go Fund Me just to see if anybody has some spare cash to throw at the bus along with us. Before photo of 1961 Ford B600 bus. Keith Lively acting like a hitchhiker beside bus after front end removed. 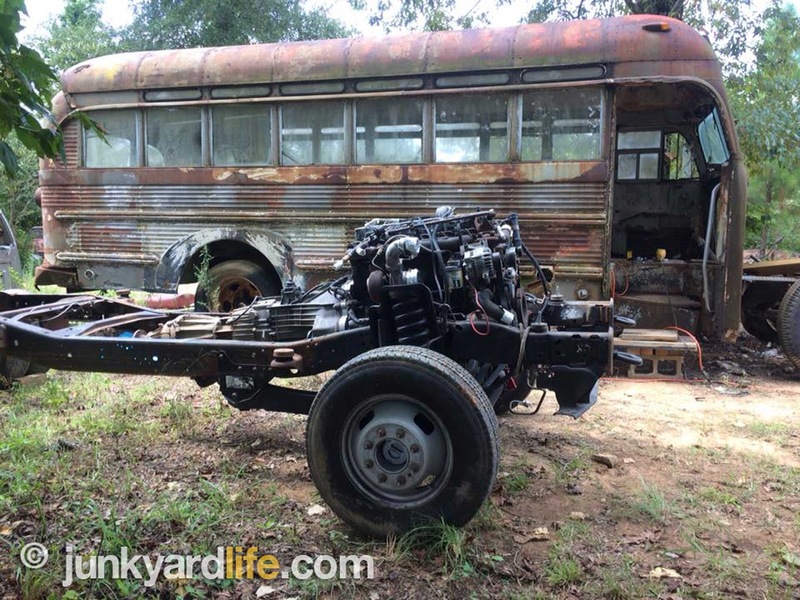 Front half of bus frame cut away along with much of thick floorpan. 2005 Ford F350 chassis stuffed under bus. Door will be added near midpoint on this side. Left rear exit door remains. Interior of 1961 Ford bus with the 2005 chassis preliminary mocked-up in place. Driver's seat will move back beside second side window of bus. Follow us, as we try to meet our deadline: The 2019 Hot Rod Power Tour. We plan to take the bus on the entire road trip. Drag racing, auto crossing, and cooking red wienies on the grill for all who gather around at each stop along the way. 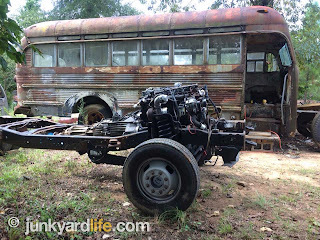 We plan to have lots of fun with this build – turning a forgotten, old 1961 Ford B600 bus that was a storage shed into a 4-wheel-drive monster VW transport beast. We are no stranger to rescue missions involving vehicles thrown in the trash pile, junkyard, or scrap heap. The entire Junkyard Life team will dig deep.